Hal has become infected with a zombie virus. It's not his fault, and now he is trying to survive. Help Hal stay alive by consuming human brains so he can keep on running and possibly get to the end of this crazy adventure. Just in time for Halloween, do you have what it takes to help Hal in this infinite zombie runner? Move Hal between one of 3 paths to help him avoid obstacles and collect bones to buy new upgrades. Compete for high score in 3 different leader boards, and be the first of your friends to unlock all of the achievements. Hungry Hal may be undead and have a craving for brains, but at the end of the day, he just wants to survive the apocalypse just like everyone else. Help the friendliest zombie you ever met reach the end. Team Hal! 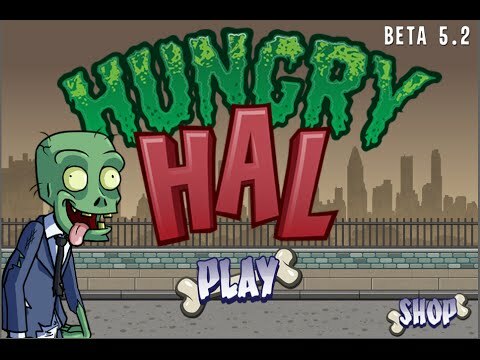 Hungry Hal is a fun, 2d endless runner game. It could also be called a 2d path runner. Either way, you help Hal avoid obstacles by moving him between 3 paths. Along the way your brain meter will start to dwindle so you need to constantly be munching on brains to stay alive. Hal is a hungry zombie after all. One of the best infinite runner games to hit the market this Halloween season. Or Endless Runner, or path runner. Whatever kind of zombie runner you want it to be, it's fun! "Play this game, I am not really a mobile game player but I found myself playing it over and over. It has what a lot of games lack now a days…FUN"